Bruce Willis has signed on to co-headline the upcoming Kane & Lynch movie, but who will be his partner in crime? Bruce Willis is a cool guy. He's been beating the crap out of people on the big screen for more than 20 years and yet somehow, even with his 50th birthday long behind him, we still take him seriously. He even looks the same; if some Hollywood genius decided to remake Die Hard, the obvious choice for Bruce Willis' role would be Bruce Willis. But before he wastes any more Eurotrash mercs, he's going to take a crack at the videogame film genre by way of Kane & Lynch, based on the not-quite-a-hit game that came out in 2007. According to producer Adrian Askarieh, who previously worked on the 2007 film Hitman, Kane & Lynch has had "two and a half years of false starts" but will begin filming in March 2010. The film is being directed by Simon Crane, a veteran stuntman and assistant director on movies including Tomb Raider, Troy and X-Men 3. It will have the same "basic premise" as the game, but won't follow the specific details. "It's essentially the story of a mercenary teaming up with a schizophrenic psychopath to save his wife and daughter," Askarieh told GameDaily. "The script has been incredibly well-received around town," he continued. "After Bruce Willis read it, he called it one of the best action scripts he's ever read, and Bruce is an expert in terms of action scripts because he's read everything over the last 20 years." 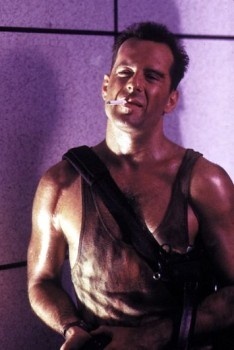 Willis will star as Kane, of course, while Lynch - the psycho half of the team - has yet to be cast. I've never played the game myself so I'm not exactly an authority on the matter, but from a purely physical perspective I can't think of anyone better suited for the job than Tommy Chong. The world's most famous stoner as a deranged, homicidal lunatic? Hey, after Paul Reiser became the biggest sleazebag in the galaxy in Aliens, I'm open to pretty much anything.